Harriet Backer (1845–1932), Chez Moi (1887), oil on canvas, 88.5 x 100 cm, Nasjonalgalleriet, Oslo. Wikimedia Commons. Harriet Backer (1845–1932) is one of Norway’s most famous artists, and a pioneering woman painter too. Despite an internationally successful career, she is now hardly known outside her native country. Born into a wealthy family living at Holmestrand in Vestfold (on the west bank of Oslofjord, south of Oslo), she showed an early aptitude for drawing. When the family moved to Oslo in 1857 she was originally sent to a school for governesses. She started drawing and painting lessons in Oslo in 1867, and was able to travel in the company of her sister, the concert pianist and composer Agathe Backer-Grøndahl. Her talent was recognised, and in 1874 she went to Munich where she became a pupil of Eilif Peterssen. Harriet Backer (1845–1932), Avskjeden (The Farewell) (1878), oil on canvas, 81.5 x 89 cm, Nasjonalgalleriet, Oslo. Wikimedia Commons. 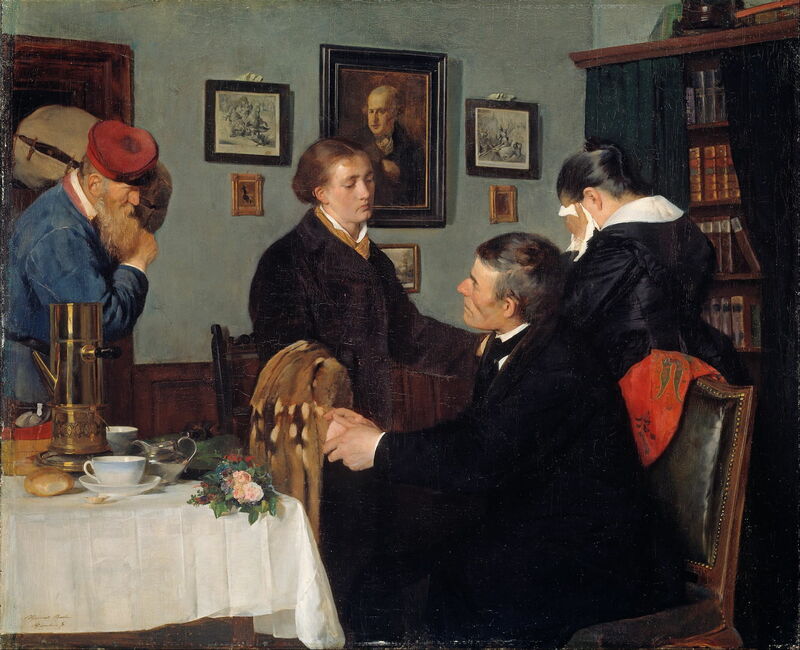 Avskjeden (The Farewell) (1878) was probably her first really successful painting. It shows a grown daughter, left of centre, bidding farewell to her family as she leaves home. Backer probably painted this from her own emotional experience, as her father died in 1877, and she had informed her mother that she did not intend returning home, but pursuing her painting career instead. It also marked the year that she went to Paris, where she was a pupil of Léon Bonnat and Jean-Léon Gérôme, and for a brief period of Jules Bastien-Lepage. 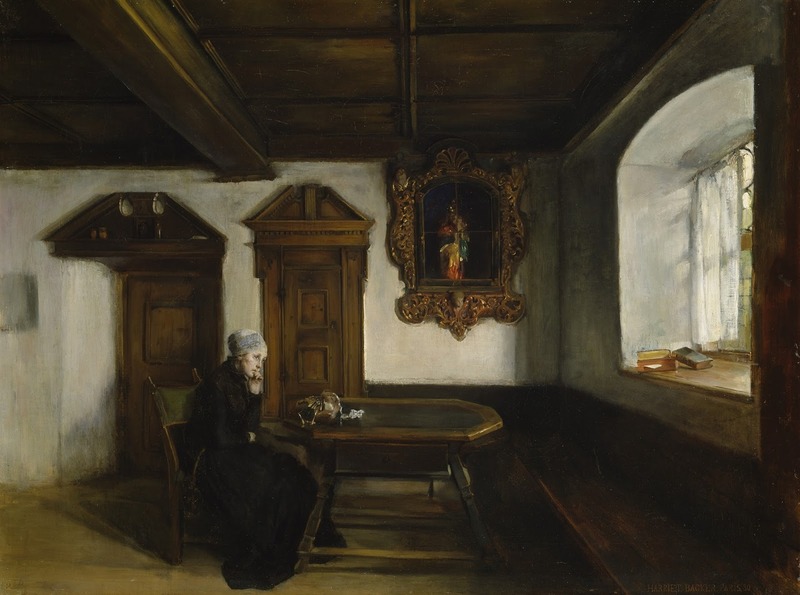 Harriet Backer (1845–1932), Solitude (c 1880), media and dimensions not known, Private collection. The Athenaeum. In France, her style started to loosen up: another early success was her Solitude (c 1880), her first painting accepted for the Salon in 1880. 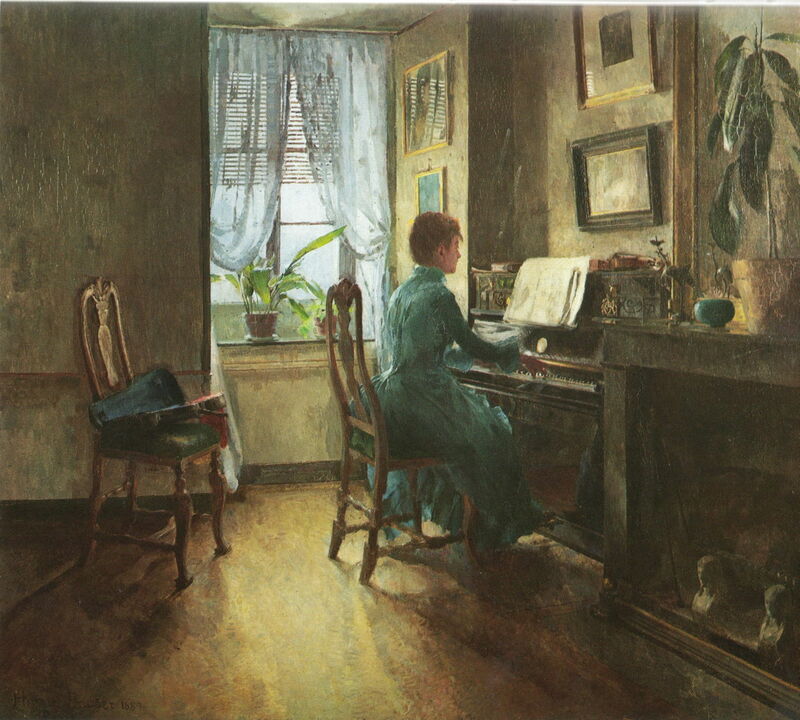 This was one of her first interiors featuring limited light, whose play was to become a dominant theme in her paintings. Although she remained based in Paris, she returned to Norway each summer, where she seems to have painted mostly landscapes. Harriet Backer (1845–1932), Blått interiør (Blue Interior) (1883), oil on canvas, 84 x 66 cm, Nasjonalgalleriet, Oslo. Wikimedia Commons. 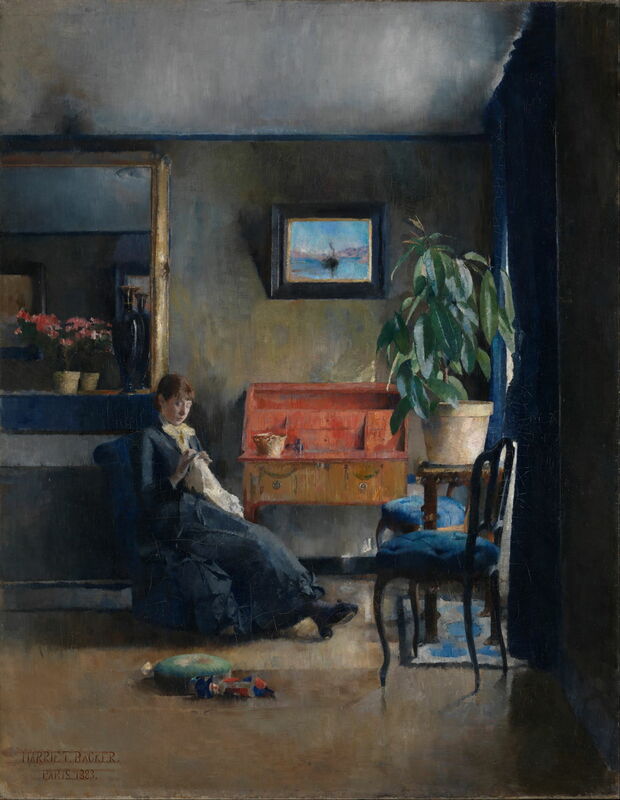 One of her friends, Asta Nørregard, another Norwegian painter studying in Paris at the time, was the model for her Blått interiør (Blue Interior) (1883). It develops the theme of the play of light from the window on the person and contents of the interior of the room. Here the composition is complicated by the presence of a large mirror at the left. Her brushstrokes are now very painterly, and bright colours are starting to bring their harmonies and contrasts. Harriet Backer (1845–1932), To barn og tregruppe (Two children and a group of trees) (1885), oil on canvas, 62 x 87 cm, Private collection. Wikimedia Commons. 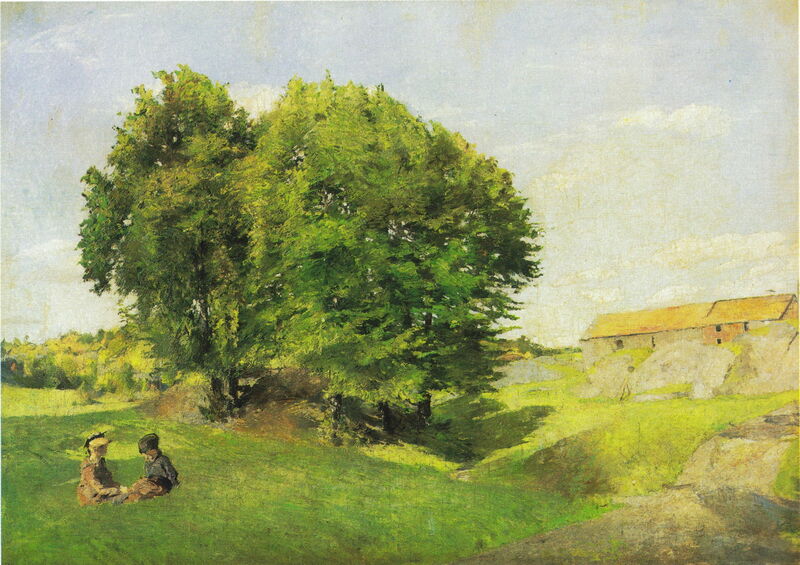 To barn og tregruppe (Two children and a group of trees) (1885) is a good example of her summer landscapes, which were probably at least started en plein air, if finished in the studio, perhaps. She had learned to paint plein air in Paris, with its great popularity not just among Impressionists. Harriet Backer (1845–1932), På Bleikeplassen, Jæren (At the Bleaching Place, Jæren) (1886), media not known, 53 x 72 cm, location not known. Wikimedia Commons. På Bleikeplassen, Jæren (At the Bleaching Place, Jæren) (1886) is a pure plein air oil sketch, in which time did not permit the addition of details to the buildings or figures. It shows three women hard at work laying linen garments out for bleaching in the sunshine. 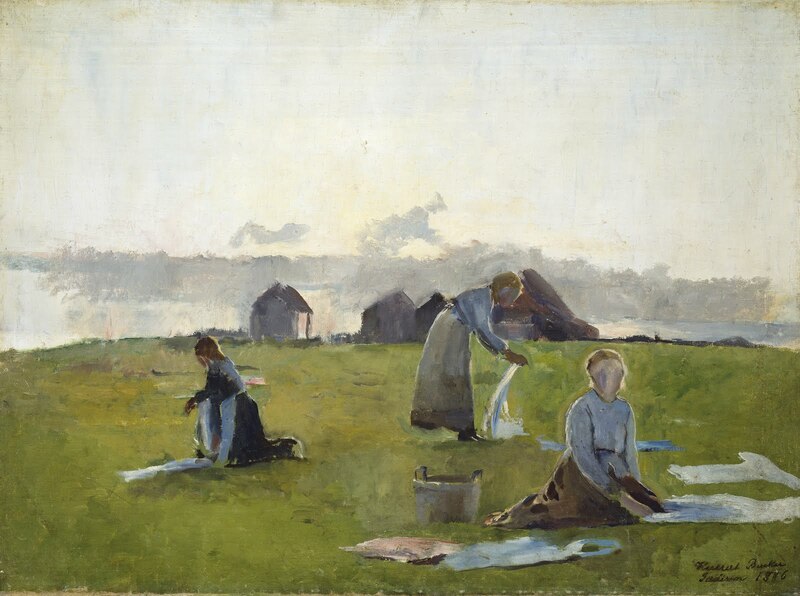 Harriet Backer (1845–1932), På blekevollen (Bleaching Linen) (1886-7), oil on canvas, dimensions not known, Bergen Kunstmuseum. Wikimedia Commons. 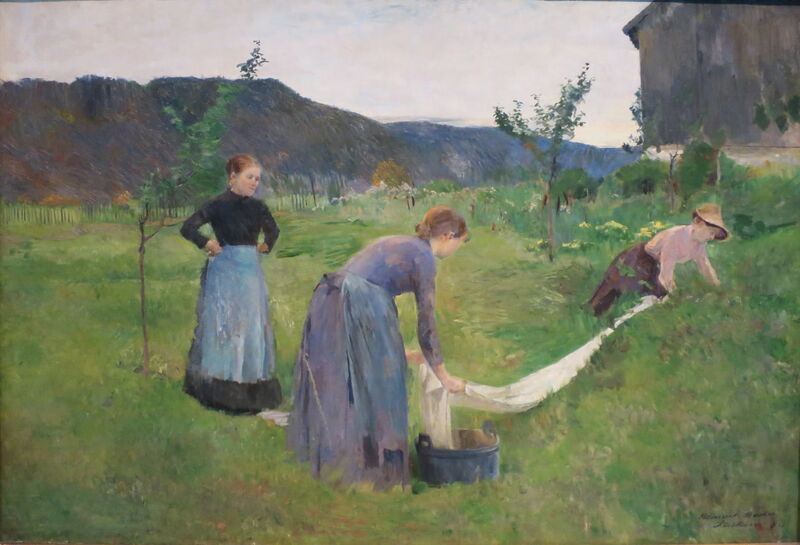 På blekevollen (Bleaching Linen) (1886-7) is a more finished painting of similar activity. At this time her style was clearly Impressionist, but expressed in her distinctive way. Back in Paris, she continued to explore the play of light in interiors, with Chez Moi (1887), for example. Here she strikes a fine balance between the painterly and fine detail: the piano keys, dress, plant, and above all the reflections on the pictures hanging on the wall, are all shown in with necessary precision. In 1888 she finally returned to Norway and settled in Sandvika, on the outskirts of Oslo. There she continued to concentrate on interiors, including those illuminated by lamplight. Harriet Backer (1845–1932), Landskap fra Ulvin (Landscape from Ulvin) (1889), oil on canvas, 38.1 x 53.1 cm, Drammens Museum for kunst og kulturhistorie, Drammen, Norway The Athenaeum. The Athenaeum. 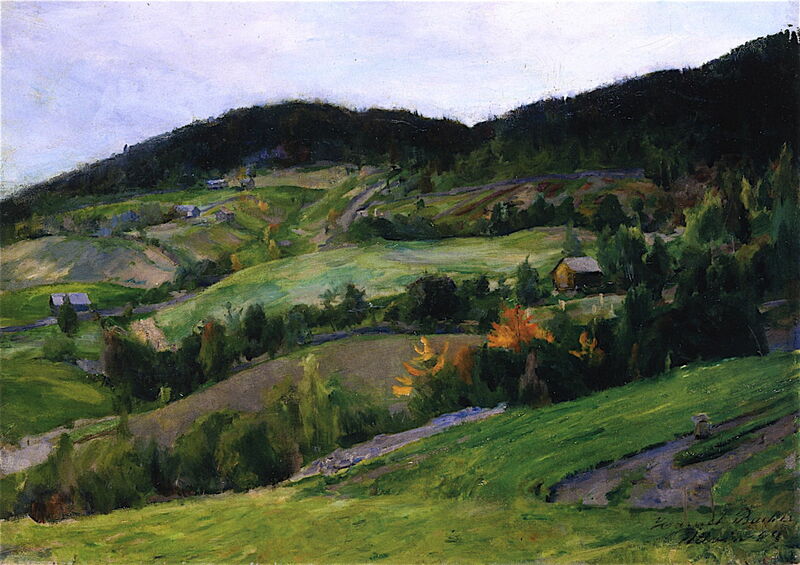 During the summer, she still went out into the rich countryside, where she painted en plein air, capturing the glorious colours of the intense Norwegian summer. Her Landskap fra Ulvin (Landscape from Ulvin) (1889) is a good example; sadly relatively few of her landscapes seem to have made their way into public collections. Most seem to be in private ownership, thus inaccessible. Growing recognition, including the award of a silver medal at the Exposition Internationale of 1889, brought requests for her to take on pupils, and in that year she started teaching in what soon developed into a thriving art school. The final years of the 1800s and the start of the new century marked the peak of her career, with a succession of major paintings in addition to that teaching. I will show some examples of that later work in the next and concluding article in this series. Posted in General, Painting and tagged Backer, Bonnat, Gérôme, Impressionism, Nørregard, Norway, painting, Peterssen. Bookmark the permalink.